To Cite: Mantini C, Messalli G, Paloscia L, Mastrodicasa D, Francone M, et al. Unexplained Cardiac Arrest After Near Drowning in a Young Experienced Swimmer: Insight from Cardiovascular Magnetic Resonance Imaging, Iran J Radiol. 2016 ; 13(4):e36779. doi: 10.5812/iranjradiol.36779. Cardiac magnetic resonance imaging (cMRI) is a well-established noninvasive imaging modality in clinical cardiology. Its ability to provide tissue characterization make it well suited for the study of patients with cardiac diseases. We describe a multi-modality imaging evaluation of a 45-year-old man who experienced a near drowning event during swimming. We underline the unique capability of tissue characterization provided by cMRI, which allowed detection of subtle, clinically unrecognizable myocardial damage for understanding the causes of sudden cardiac arrest and also showed the small damages caused by cardiopulmonary resuscitation. Cardiac magnetic resonance imaging (cMRI) is a well-established noninvasive imaging modality in clinical cardiology. Its unsurpassed accuracy in defining cardiac morphology and function and its ability to provide tissue characterization make it well suited for the study of patients with cardiac diseases (1, 2). Using T2-weighted techniques, areas of edema and inflammation can be identified in the myocardium. Late gadolinium enhancement (LGE) was a major advancement in the development of tissue characterization techniques, allowing the unique ability of cMRI to differentiate ischemic heart disease from nonischemic cardiomyopathies. A 45-year-old man without cardiovascular risk factors experienced a near drowning event during swimming and was admitted to our hospital after about forty minutes of successfully accomplished basic and advanced cardiopulmonary resuscitation (early tracheal intubation, chest compressions and five 200-J successive transthoracic shocks) for low voltage ventricular fibrillation (Figure 1) (3). Figure 1. A 45-year-old man with a near drowning experience who underwent cardiopulmonary resuscitation. ECG shows conversion of ventricular fibrillation to sinus rhythm after the fifth 200-J transthoracic shock. At admission, cardiac Troponin T was 83.7 pg/mL (normal < 14 pg/mL), creatine kinase isoenzyme Mb was 14 ng/mL (normal value ranges: 1.39-6.22 ng/mL), and myoglobin was 2988 ng/mL (normal value ranges: 25 - 72 ng/mL). 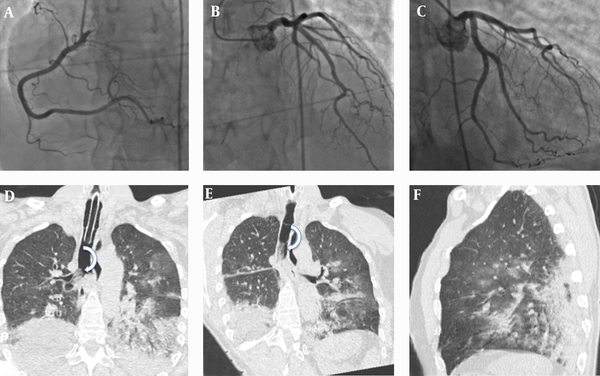 Transthoracic echocardiography was unremarkable and emergency coronary angiography (Figure 2A-C) performed at admission showed a very well preserved coronary artery tree. Figure 2. A-C, Coronary angiography performed at admission shows normal coronary flow without obvious angiographic obstruction. Coronal (D, E) and sagittal (F) thin-section chest computed tomography reveals bilateral and diffuse areas of ground-glass attenuation and airspace consolidation with air bronchogram seen mainly in lung bases resulted from lung damage and ventilation-perfusion mismatching caused by water inhalation and laryngospasm secondary to hypoxia. Curved arrows in D and E show the presence of secretions in the trachea and right main bronchus. Thin-section chest CT obtained about 8-hours later revealed bilateral diffuse areas of ground-glass attenuation and airspace consolidation compatible with lung damage and ventilation-perfusion mismatching by water inhalation (Figure 2D-F). Since 1975, it has been reported that cardiac enzymes can rise as a result of cardiopulmonary resuscitation (4). To figure out the cause of near drowning, on the tenth day after resuscitation, the patient underwent cMRI. On cMRI, global left ventricular function and volumes were preserved, whereas a mild regional hypokinesis was present at the level of the left ventricular mid-inferior wall on cine steady-state free precession (SSFP) images. In the same location, T2 weighted short tau inversion-recovery images (T2W-STIR) depicted a subtle high signal intensity linear band subendocardially located with corresponding subendocardial late gadolinium enhancement (LGE) on two dimensional (2D) inversion-recovery sequences compatible with a small acute inferior myocardial infarction (curved arrow in Figure 3B and Figure 3E). Figure 3. A, Short-axis T1 weighted (T1W) anatomical image shows the anterolateral (arrow) and posterior (arrowhead) muscles. In the short-axis (B) and vertical long axis (C, D) T2W-STIR images, the anterolateral (arrows in B and C) and posteromedial (arrowheads in B and D) papillary muscles have a hyperintense signal caused by increased water content (myocardial edema). On late contrast-enhanced (CE) imaging (E, F, and H), the anterolateral (arrow) and the medial portion of the posterior papillary muscles (arrowheads) are strongly enhanced. On T2W-STIR images (curved-arrow in B), a subtle hyperintensity, suggestive of edema, was detected in the middle inferior wall and CE-IR images confirmed a small (< 10 mm) correspondent subendocardial infarction (curved-arrow in E). The first-pass perfusion image (G) clearly shows a perfusion defect localized exactly at this cardiac structure. Short-axis T2W-STIR image (asterisks in B) also shows slight edema of the anterior chest wall probably due to chest compressions and transthoracic shocks. An associated papillary muscle involvement was also observed with cMRI, characterized with edematous imbibition of the anterolateral and the medial portion of the posteromedial papillary muscle (arrow and arrowhead in Figure 3B-D), with an associated complete perfusion defect (arrow and arrowhead in Figure 3G) and corresponding intense LGE detectable on contrast enhanced inversion recovery (CE-IR) sequences (arrow and arrowhead in Figure 3E, F, and H). T2W-STIR imaging also showed slight edema of the anterior chest wall likely referable to the recent cardiac resuscitation experienced by the patient (asterisks in Figure 3B). Papillary muscle involvement was previously described in an out-of-hospital cardiac arrest survivor without angiographic evidence of coronary artery disease and together with chest wall edema was correlated with cardiopulmonary resuscitation (5). Medico-legal autopsy cases demostrated that prolonged resuscitation in adults produces a recognizable pattern of myocardial injury often distributed in the papillary muscles (6) as demonstrated by the presence of hyperintense signal on T2W-STIR (edema) and late contrast-enhanced images (necrosis) of our cases. This case emphasizes the unique capability of tissue characterization provided by cMRI which allows detection of subtle, clinically unrecognizable myocardial damage, very important to aid other diagnostic techniques for understanding the causes of a sudden cardiac arrest and eventually to change patient management for secondary prevention. In this case, cMRI also showed small damages of cardiopulmonary resuscitation, damages that could be considered a favourable trade off to have a life saved. Authors’ Contributions: All authors contributed equally.